The Lemuel Scarbrough Center for Writing supports a culture of writing at Austin College. 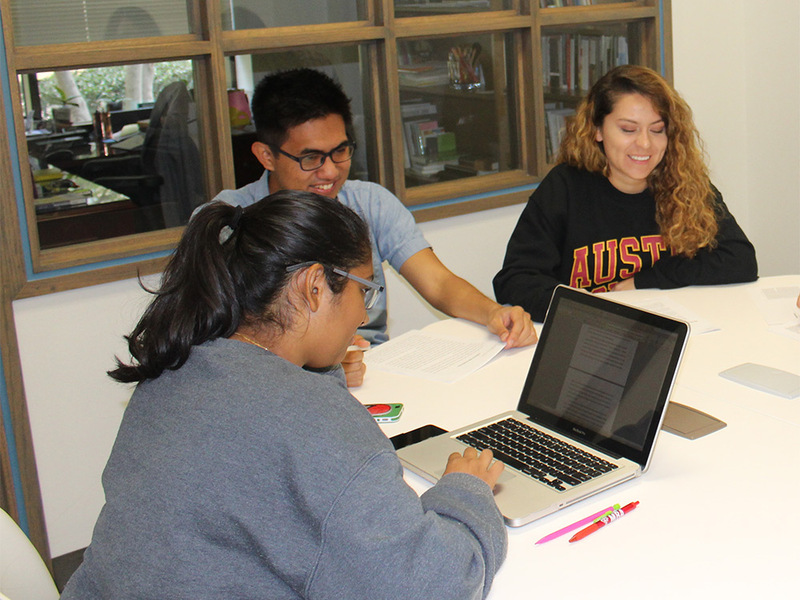 Located in the Abell Library Center, the Scarbrough Center for Writing provides free peer writing assistance, writing workshops and resources, and support for the teaching of writing across campus. Working collaboratively with students and faculty, the Center aims to cultivate deep engagement with the writing and thinking practices that drive intellectual inquiry, civic engagement, and professional endeavors. The Scarbrough Center for Writing (SCW) now offers free one-to-one peer writing consultations. The centerpiece of the SCW’s work, these collaborative writing sessions are responsive to each student’s writing goals and needs. All students are welcome to visit the SCW for writing in any discipline or field, at any stage of the writing process. 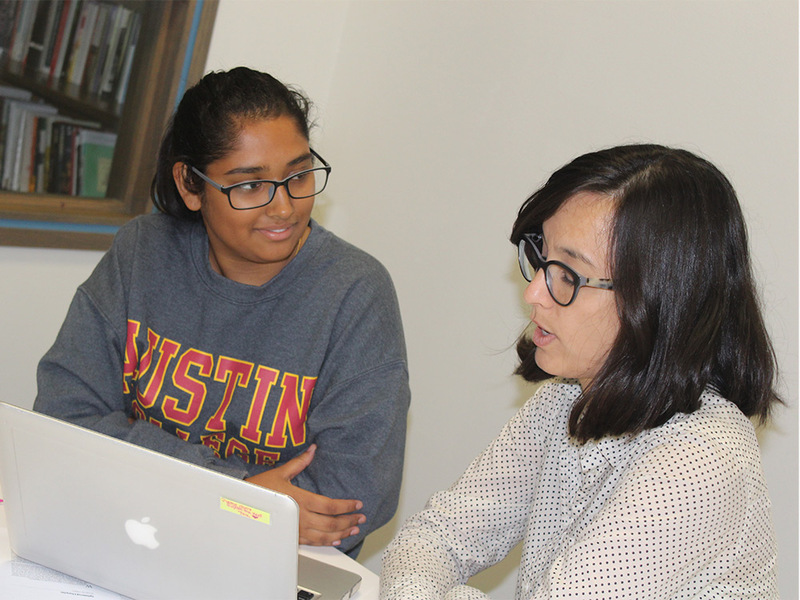 Research shows that all writers benefit from sharing their writing with others, and our goal is to provide Austin College students opportunities to share their writing with knowledgeable peer writing consultants. To make an appointment, please visit our online schedule. Interested in Becoming a Peer Writing Assistant? Peer writing assistants are at the heart of the SCW’s work. Through providing support for student writers, peer writing assistants are themselves enriched and challenged. Teaching writing prompts assistants and teachers alike to hone writing strategies, to refine their language for talking about writing, and to think differently about their own writing processes. Writing tutors from colleges and universities across the country–and the world–find this to be deeply rewarding work. To become peer writing assistants, interested students will take a course, Tutoring Writing: Theory and Practice (WRT 285, offered Spring 2018) that will prepare them to work with writers in the SCW. In this course as well as in ongoing education and professional development, peer writing assistants will develop and refine knowledge of theories of writing, writing center theory and pedagogy, writing processes and writing strategies, and rhetorical and genre knowledge for writing in different disciplines and contexts. 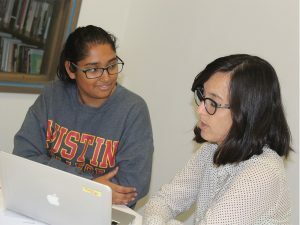 While peer writing assistants may have more first-hand knowledge of writing for the discipline of their major(s) and/or minor, they will also have the rhetorical and genre knowledge to help students with writing projects from across campus. If you are interested in becoming a peer writing assistant or in learning more about the course, please fill out the contact form for details. If you’re a faculty member or student who would like to recommend another student for a position, please complete the contact form or encourage the student to contact Dr. Daniels Storey. Faculty may also contact the SCW to schedule a class visit to the Center, or to have a peer writing assistant visit their class to give a brief presentation about the SCW and its services. These presentations provide an opportunity to learn about the SCW from a fellow student, and they can be tailored and scheduled to complement specific writing assignments throughout the semester. If you would like to request a class visit, please fill out the Class Visit Request Form. In addition, the SCW can work with faculty to design, and co-facilitate, in-class writing activities or lessons. The SCW will also offer workshops and Johnson Center programs around teaching and writing throughout the year. If you would like more information about these resources or would like to set up a consultation, please fill out the contact form. The SCW will partner with the Johnson Center to provide support for faculty writing. Faculty members are also welcome to contact Dr. Daniels Storey for writing consultations on any writing project. 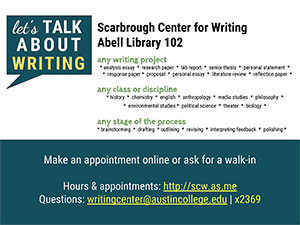 Stop by the Scarbrough Center for Writing in Abell Library room 102 or call x2835. You may also use the contact form, get in touch with Dr. Lisha Daniels Storey, or email the Writing Center.